It’s no secret that Japan has a rapidly aging population. And with such a population comes the unpleasantness of adult diapers, which have skyrocketed in popularity over the past few years in the country. Usually, these diapers are tossed in a landfill or incinerated after use. But as we’ve seen with Sharps Compliance’s syringe to cement process, medical waste can have a sanitary second life. That’s where Japanese automation firm Super Faiths’ SFD Recycle System comes in. 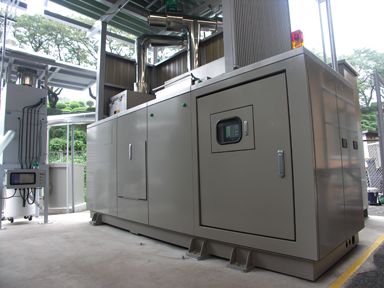 The machine shreds, dries, and sterilizes disposal diapers into a bacteria-free fuel pellet material that can be used for heating. According to CNet, the pellet material contains 5,000 kcal of heat per kilogram and has a third of the weight and volume of a diaper. The machine is already available in Japan–apparently, two SFD systems have been installed in a western Tokyo hospital, where they process 1,400 pounds of used diapers each day. It’s a brilliant idea for hospitals, but for home use (the system comes in a small model) it seems like cloth diapers would be much more efficient than a hulking machine. Check out the SFD system in action below.